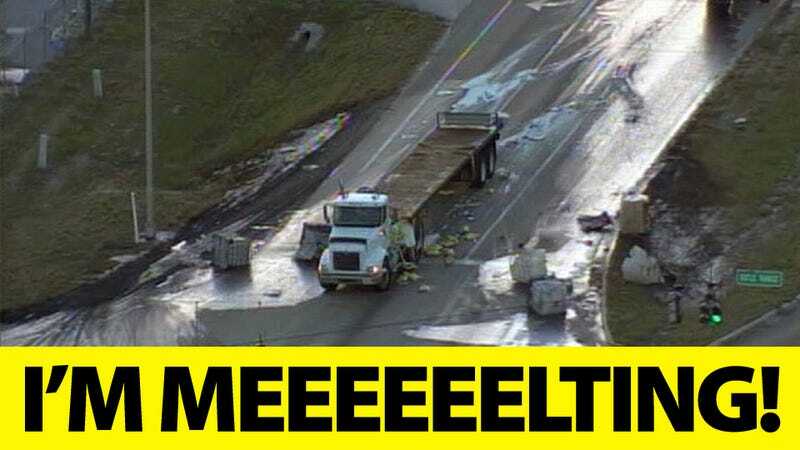 If a Truck Loaded With Sulfuric Acid Crashes, Does It Melt the Road? This truck carrying 1,000 gallons of sulfuric acid crashed in Bartow, Florida, spilling its cargo over State Road 60. The driver was burned, people and animals have been evacuated, and a hazardous materials team in on the scene. But my question is: if sulfuric acid drops on a road, would the road melt? I always imagine that, when this happens, the asphalt starts to dissolve and the road turns into a black goo ready to swallow everything on its surface. But as awesome an image that may sound like, it's not the case—fortunately! The asphalt will be affected by it, but it will not melt or present any visible erosion right away. The same will happen with any concrete in the area. But while no melting will occur, the sulphuric acid will accelerate the corrosion of these materials. Just like with acid rain, the sulfuric acid will start to corrode them. But being a much larger and concentrated quantity, the effect will be a bit more dramatic over time. The soil in the area would also be affected, becoming poisonous. To solve the problem, part of the soil and any affected plants can be removed. To compensate for added acid in the area, decontamination teams have to use an alkaline substance. The high pH alkali, which could be soda ash or baking soda, will compensate the low pH of the sulfuric acid, bringing it closer to a neutral level. Of course, before the clean up happens, there has to be an evacuation of the area because of the poisonous gases that happen during the spill. In this case it was even worse, because the acid mixed with salt pellets that were transported in the same truck. When combined, this results in hydrogen chloride gas, a much more dangerous substance that can cause coughing and choking due to inflammation of the nose, throat, and the upper respiratory tract. Why was the truck carrying two compounds that would combine into a hazardous gas in case of crash? No idea. But thankfully, apart from the driver's injuries, nothing really bad has happened.